Comments for the medically fragile, technology dependent waiver renewal are due May 6. The state invites families to provide their input for the renewal of the Home and Community Based Services (HCBS) Waiver for children who are medically fragile and technology dependent. 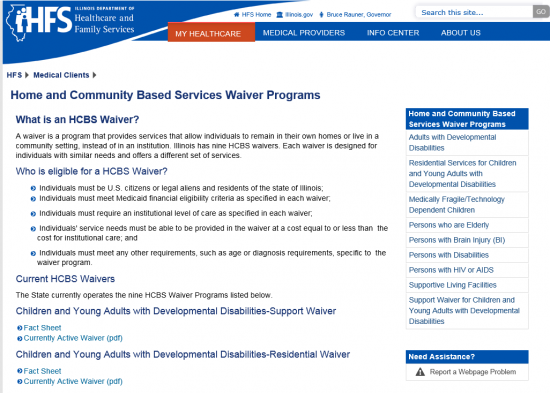 This waiver is operated under the Illinois Department of Healthcare and Family Services (HFS). The Notice of Public Information can be found on the HFS webpage at https://www.illinois.gov/hfs/SiteCollectionDocuments/4517MFTDPublicNotice.pdf. Please direct any questions to HFS at the address listed above. Modifying processes related to Participant Centered Planning (PCP) in accordance the Centers for Medicare and Medicaid Services (CMS) published final regulations that pertain to Home and Community-Based Services (HCBS) programs, including 1915 (c) , 1915 (i) and 1915(k) as described in 42 CFR 441.301(c) (4) (5) and 441.710(a) (1) (2). The modifications enable waiver participants and families to direct the planning process, include representative(s) whom they have freely chosen, resulting in a person-centered plan with individually identified goals and preferences; defined outcomes in the most integrated community setting, and the delivery of services in a manner that reflects personal preferences and choices and assurances of health and welfare. Language reflecting Participant Centered Planning is reflected in Appendix D.
Removing Medically Supervised Day Care as a waiver service. This service has been in the waiver since its inception and has never been used. There are no licensed medically supervised day care providers in Illinois. Updating performance measures to comply with federal CMS March 2014 guidance.